Guatemala has the highest population of all the countries in Central America and also the youngest, with almost half under the age of 19. CRS has been doing humanitarian work in Guatemala for more than 50 years, supporting food security, nutrition, health, agriculture, education, disaster risk reduction, and emergency response programs focused on the poorest and most vulnerable. CRS works through local partners to implement projects and interventions, a strategy that strengthens local capacity and skills and promotes sustainable solutions. For many families in rural areas of Guatemala, growing enough food to eat is a yearly struggle. As a result, many are affected by poverty and malnutrition. Considering more than half of the population is under 19 years of age, this is particularly alarming. Monica Rodriguez is tackling child hunger head on. 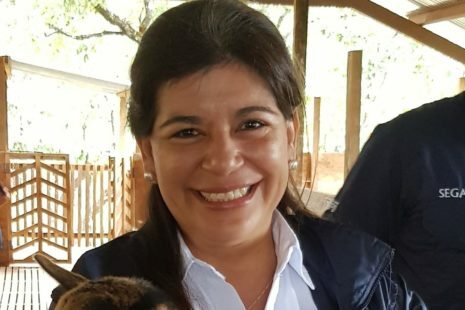 After receiving her master’s degree in world hunger, malnutrition and development in the United States, Monica returned to Guatemala and joined Catholic Relief Services (CRS) 12 years ago. At CRS, Monica uses her knowledge and skills to implement programs that serve the poor. She is the Project Manager of SEGAMIL, a program that focuses on providing women with resources and services to ensure the well-being and nutrition of their children from pregnancy to age 2. A malnourished child gets sick more often, doesn’t do as well in school and can become physically and mentally stunted. Consequently, communities remain trapped in the cycle of poverty. CRS believes nutrition needs to be addressed in an integral way. This can include farming techniques, health classes, and activities to generate income and community organization. Monica has met many people who have benefited from the program, but one stands out. Norma, the mother of 2-year-old Victor, “has shown me an alive faith.” Once a program participant, Norma teaches other mothers what she was taught when she was expecting Victor: how to prevent malnutrition, treat common illnesses and improve hygiene. Being a mentor to other mothers ensures that the lessons Norma learned reach more people and will be passed down for generations to come. That is exactly what Monica wants. Because it is not only about serving the poor. “We want people to change their lives with quality programs,” she says. To learn more about the country or to hear personal accounts of CRS’ work in Guatemala, check out CRS in Guatemala and the CRS Rice Bowl Story of Hope.